Google(s goog) announced on Monday that it’s in the process of acquiring Nest Labs, a home-automation company known for its digital thermostats and smoke alarms. The proposed purchase for $3.2 billion, which is to close in coming months, will give the Silicon Valley giant one of the hottest names in energy-management technology and product design, and comes at a time when Google is also expanding its presence in robotics, energy and internet-of-things (IoT) technology. Nest’s mission is to reinvent unloved but important devices in the home such as thermostats and smoke alarms. Since its launch in 2011, the Nest Learning Thermostat has been a consistent best seller–and the recently launched Protect (Smoke + CO Alarm) has had rave reviews. The release added that Nest would retain its own brand identify, and that it would continue to operate under the leadership of Nest CEO Tony Fadell (you can see a video of Fadell speaking at Gigaom’s recent Roadmap conference below). Fadell said he is “thrilled” to join Google in the blog posts, but has also suggested he is attuned to the data implications of Nest — which collects information about consumers’ domestic activities — being rolled into Google’s giant data collection. For Nest, the Google takeover will provide it with protection from larger competitors like Honeywell who have been attacking the startup with patent lawsuits. It also gives the company the financial means to continue scaling; as my colleague Katie Fehrenbacher reported in early January, Nest was on the hunt for more funding to launch new products and weather the lawsuits. The Nest acquisition isn’t the first time Google has dabbled in the internet of things space: The company announced an ambitious initiative dubbed Android @Home at its Google I/O developer conference in 2011, at the time saying that it wanted to launch internet-connected light bulbs in cooperation with Lighting Science. However, those products never saw the light of day. Still, there has been chatter that Google has continued to invest in the connected home space, and judging from Linkedin profiles, it looks like the Android @Home initiative is alive and well within Google. Google, which requires a huge amount of power to keep its servers running, has long had an interest in energy efficiency. And, as we reported last fall, the company has been quietly experimenting with a smart thermostat project called EnergySense. The Nest acquisition also comes on the heels of Google’s acquisition of robot-maker Boston Dynamics, and after Google Ventures poured $258 million into ride-sharing service Uber last year. 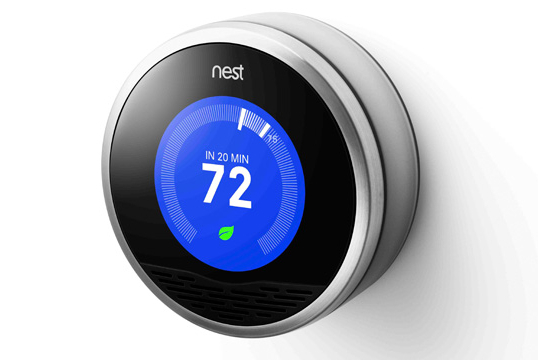 After the Nest acquisition by Google, who’s leading the innovation in your opinion? Which startups are going to have a disruptive influence in the market? Ah, such short memories. Google already went down (and out) on this path years ago with its “PowerMeter.” Consumer uptake = zero. I’m surprised at all the negative comments… Google is the evil now? A smarter way for some to manage energy being bought buy the world’s biggest information service kind of makes sense to me. It’s not necessarily that Google is Evil it’s that they really haven’t lived up to their “Do No Evil” mantra. They sounded like the tech Hippocrates but sadly. why faith and trust in Google is at an all time low ..yet profits are up. Just like all those hated monoliths we ranted about back in the day. Google has become them. So sad. The silver lining is that Nest started a trend, so we’re already getting competitors in the space. Look forward to owning a home automation device that doesn’t have any link to monetization through an ad network. Well, now Google knows when you’re home, what room you’re in, and all the attendant meta-data. You just know that Nest Intelligent Thermostat version 3 will include a small screen with advertisements by Google; and of course, the NSA will have even more intimate knowledge of the American populace. Thanks Nest. Just just made a good thing a bad thing. The purchase price reflects that data that Nest brings to the table. A company with two physical products is hardly worth 3.2 billion but when said company has a years worth of valuable data on how today’s modern home is managed and occupied. That potential alone is a veritable gold mine. Ugh. Just stop it Google. I can see where the acquisition makes sense, but not at that price.